Sherpa mountaineers in Nepal say a rise in the rate of snow and ice melt on Mount Everest has exposed bare rock faces and made it dangerous to climb. They say crampons and ice axes, usually used on Mount Everest, are now becoming hazardous equipment. The climbers say if the ice continues to melt at the same rate, it will threaten future expeditions. 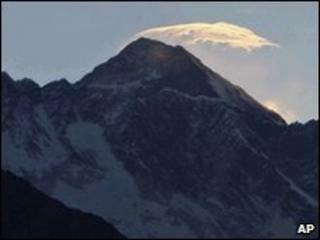 Studies show temperatures rising faster at Mount Everest than in the rest of South Asia. They show the rise has led to a reduced snowfall over the mountains and has caused glaciers to melt. As the season to summit Mount Everest comes to an end, sherpas returning to Nepal's capital, Kathmandu, say they have observed an increase in the rate that snow and ice is melting on the mountain. They say that conditions are becoming more treacherous because climbers now have to negotiate exposed rock faces and avoid being hit by falling boulders that are being dislodged as the ice melts. "When there's no ice and only rock, metal objects don't bite into rock, so you tend to slip and you be more clumsy on this," expedition leader Dawa Stephen Sherpa says. "So when you're up at 8,000m or higher you're having a very awkward climb. It becomes dangerous, not just awkward." Mr Sherpa, who regularly leads expeditions to Everest, says that if the ice continues to melt at the current rate, climbing the mountain will become more expensive because of the dangers. At the moment it costs at least $70,000 to pay for the necessary Nepalese climbing permits, guides, equipment and travel to Mount Everest. Mr Sherpa also says it will become more difficult to climb the world's highest mountain, and that mountaineers will need to have advanced technical skills before attempting it. Meanwhile, a US-based scientific survey has installed a number of photographic cameras in the Everest region to record the rate of melting ice and snow. The cameras are programmed take a photograph every 30 minute to provide a time-lapse record of changing conditions.